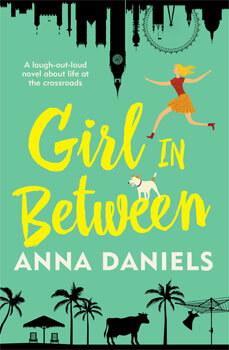 Thanks to Allen and Unwin here is your chance to win one of 10 x copies of Girl in Between by Anna Daniels. Life can be tricky when you're a girl in between relationships, careers and cities... and sometimes you have to face some uncomfortable truths. The sparkling debut from comic TV and radio presenter, Anna Daniels. As the girl in between relationships, careers and cities, Lucy is facing some awkward truths - like her mum's obsession with Cher, her father's unsolicited advice, and the probability there's more cash on the floor of her parents' car than in her own bank account. Thank goodness for Lucy's crazy-but-wonderful best friend, Rosie, who's around to cushion reality with wild nights at the local Whipcrack Hotel, escapades in Japanese mud baths, and double dating under the Christmas lights in London. But will Lucy work out what she really wants to do in life - and who she wants to share it with Girl in Between is a warm, funny, charmingly Australian story about life at the crossroads. Featuring an endearing and irrepressible cast of characters, it will have you chuckling from start to finish. Anna Daniels has enjoyed great success as a comedic storyteller since kicking off her career by winning the ABC's 'Comedy Segment of the Year Award' for an interview with Russell Crowe. She then went on to co-create the ABC's first online sketch comedy series 'Tough at the Top' with Melbourne comedian, Anne Edmonds. For several years Anna wrote and presented funny upbeat stories for The Project, winning over viewers with her warm, silly, endearing style. Having grown up in Rockhampton, she particularly championed the stories and characters of rural and regional Australia with affection and humour. As well as The Project, Anna has written, presented and/or produced radio, TV and online content for Queensland Weekender, Red Symons' Breakfast Show, and the BBC One series, 'John Bishop's Australia'. Anna can now be heard presenting statewide programs on 612 ABC Brisbane.